A Japanese ship has been caught with a slaughtered whale in the Antarctic in defiance of an international court decision against Tokyo's hunts, activist group Sea Shepherd said Sunday. The conservationist organisation—whose two vessels departed Australia last month for the Southern Ocean to disrupt the hunt—said it spotted the Nisshin Maru in the Australian whale sanctuary around the nation's Antarctic territory. The Japanese fleet set sail on November 18 last year in defiance of a worldwide moratorium on commercial whaling and international opposition. 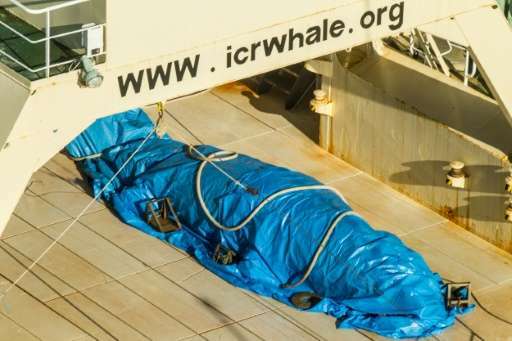 Sea Shepherd released photographs of a dead minke whale on the deck of the Nisshin Maru, a factory ship, adding that the vessel's crew covered the carcass with a tarp when its helicopter approached. The dead whale is the first to be documented since the ruling by the International Court of Justice (ICJ), said Sea Shepherd. It has spent more than a decade harassing Japanese harpoon ships during the Southern Hemisphere summer. 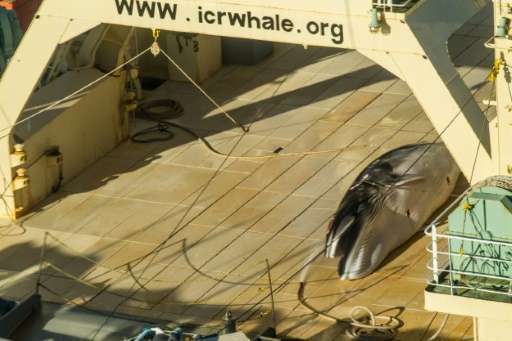 "The fact that the Japanese crew went to cover up their harpoons and the dead minke whale on deck just shows that they know what they're doing is wrong," the captain of Sea Shepherd's MY Steve Irwin, Wyanda Lublink, said in a statement. The news came a day after Japanese Prime Minister Shinzo Abe met his Australian counterpart Malcolm Turnbull in Sydney, with their talks focusing on trade and defence. Japan is a signatory to the International Whaling Commission's moratorium on whaling in force since 1986. But it exploits a loophole allowing whales to be killed for the purposes of "scientific research". Australia's Environment Minister Josh Frydenberg said in a statement his government was "deeply disappointed" Japan had returned to whaling in the Southern Ocean this summer. "We will continue our efforts in the International Whaling Commission to strongly oppose commercial whaling and so-called 'scientific' whaling, uphold the moratorium on commercial whaling and promote whale conservation," he added. In 2014 the United Nations' ICJ ordered Tokyo to end the Antarctic hunt, saying it found permits issued by Japan were "not for purposes of scientific research". Japan cancelled its 2014-15 hunt after the ruling, but restarted it the following year under a new programme with a two-thirds cut in the target catch number—saying the fresh plan was genuinely scientific. Tokyo claims it is trying to prove the whale population is large enough to sustain a return to commercial hunting. But the meat from what it calls scientific research often ends up on dinner tables. No one was available for comment at Japan's Fisheries Agency.